Rediff.com » Movies » Shooting Angadi Theru from his shoulders! 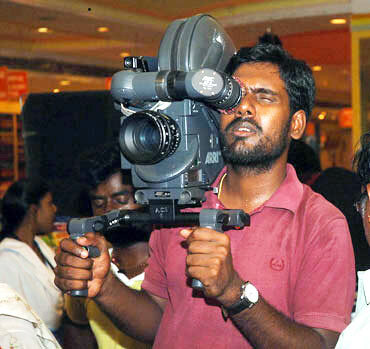 Shooting Angadi Theru from his shoulders! It is very rare that the number of screens for a film increases after a couple of weeks. But that is what happened in the case of the highly acclaimed Tamil film, Angadi Theru. The film directed by Vasantabalan continues to enthrall audiences. Other than the director and actors Anjali and Mahesh, another person who is getting a lot of congratulatory calls is first time cinematographer, Richard M Nathan, who was earlier an assistant of National award winning cinematographer K V Anand (He is currently shooting K V Anand's directorial venture Ko). Richard's candid images of Ranganathan street are being appreciated not only by senior cinematographers but by ordinary viewers too. How did Angadi Theru come to you? After assisting K V Anand in The Legend of Bhagat Singh, Khaakhee, Chellame and Sivaji, I thought I should start working on an independent project. I made a short film putting together all my work -- both ads and feature films -- and left the CD with a few directors. One of them was Vasantabalan. He was impressed with what I made. He called me and said that he was going to make a film with Ranganathan Street as the backdrop. He also told me that he had three or four people in mind, to pick as his cinematographer. He wanted me to shoot Ranganathan Street so that he could choose the cinematographer for the film. I observed the street for a few days and then borrowed a high definition camera and shot continuously for 24 hours from 10pm to 10pm. I did not sleep for 24 hours. It was very interesting to see the two different faces of the street. In the afternoon, it was full of people that you cannot even stand there, but after 11pm, it gets deserted and you see thattu kadais selling dosas, idlis, parattas, etc. It was only at night that I noticed that there are many mansions on either side of the street, where bachelors stay. It was only after 11pm that these bachelors could bring in their bikes and cycles through the street! It was only after midnight that water tankers and garbage clearance vans also entered the street. Many young men segregated the garbage then. 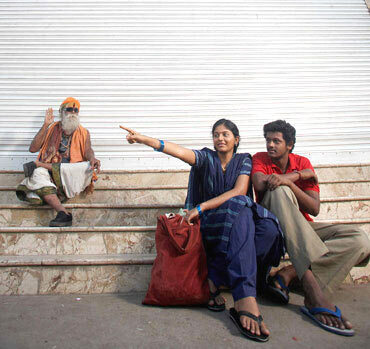 After 9am, people start swelling from the Mambalam railway station and by 12 noon, the street would be full of people. I don't think you will see such an interesting street anywhere else. There is a song called Oru Naal in the Selvaraghavan film Pudupettai. I added that song as the backdrop and made a short film of my shots, and showed it to Vasantabalan. He was so impressed with my film that he immediately signed me for Angadi Theru. He said, whatever you have shot is my film. I want the same look, same lighting and same framing and feel. It is my good fortune that I got the film. Vasantabalan is a National award-winning director. His film was shown at the Cannes Film Festival. He could have got any big cinematographer for Angadi Theru. I am lucky that I got the project. It so happened that whatever I shot on the street was what he also had in mind. As you had already shot the street, was it easy for you to shoot the film? Yes, it was. I knew the lighting pattern of the street and also the behaviour of the people. I would say shooting Angadi Theru on Ranganathan Street was like shooting wildlife; it was that unpredictable. Nothing was certain. You had to be ready with the camera all the time. What did you shoot first? We first shot the interiors of a shop. We went to a shop in T Nagar and did all the interior shots in 45 days. The mess and the dormitory portions were shot later. Once the artistes -- all newcomers -- were familiar with how a film was shot, we decided to move to the street. I read that you shot all the portions on the street with a hidden camera. Can you elaborate on that experience? Shooting on the Ranaganathan Street with a camera is just impossible. Not even one scene was shot by any film unit there because the street is always full of people and you will not get candid shots. And we had 30-35 scenes happening in and round the street, and it was impossible to shoot them with so many people around. We got permission to shoot only at night. But the advantage we had was, we had new faces as actors. Nobody knew we were shooting a film once we started. Where did you keep the hidden camera, and how did you shoot the street? I designed a normal travel bag with a small opening for the camera lens. The switching on and off of the camera and the focussing was done by remote. I carried the bag on my head, so, the viewfinder was not seen by me but I had a small monitor in my hand. I watched the image on the monitor on my palm as I walked. When the director called me up on my ceelphone to start shooting, I told my assistants to switch on the camera by remote. I then followed the artistes. The problem was I could not frame it well, light the space or cut the glare; everything was done in natural light. It was extremely challenging. Sometimes, I had to even walk backwards! You shot the entire film with a hand held camera. Why? We knew we had to shoot Ranganathan Street with a hand held camera, and if that portion alone looked different from the rest of the film, it would have looked odd. So, we decided to shoot the entire film with a hand held camera. Very tough. I was carrying a camera which weighed 20 kilos on my shoulders for the entire shoot of 135 days. I damaged my back ligaments because of this and now I have a backache! When I was an assistant cameraman, I worked really hard. I thought it would get easier when I became an independent cinematographer. But there I was, after a day's shoot, full of dirt on my shirt while my assistants were clean [laughs]. You took so much pain shooting Angadi Theru but when you shot it, did you expect it to be such a landmark film in Tamil? That was why I took so much trouble in shooting the film. No cinematographer would shoot an entire film carrying the camera on his shoulders. If needed, they would use a steady cam. I used the steady cam for only two days when I had to run up the staircase to shoot a sequence. In fact, I ran with a hand held camera but fell a couple of times which is not good for the very expensive cameras! That was when I decided to use a steady cam while running. Overwhelming. On the day of its release itself, around 30-40 directors called me and congratulated me. More than 15 cinematographers called me. All of them told me that it was a brilliant film and my camera supported the film very well. 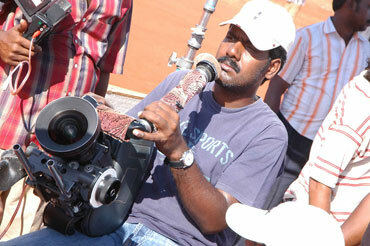 The greatest appreciation came from Balu Mahendra and he told me that the camera gelled very well with the story. I must say I could shoot a film like Angadi Theru because of the training I had under K V Anand sir. He sets such high standards on his sets that we work really hard to achieve them! I feel I must have done something good in my life to get a brilliant film like Angadi Theru made by a brilliant director with brilliant newcomers on such a brilliant location! I am blessed to have got this opportunity. Angadi Theru will remain very, very close to my heart always. Review: Angadi Theru is a must-watch!